Somewhere in Monte Carlo, Novak Djokovic is licking his chops. The world No. 2 may not have played this year’s iteration of the Rolex Monte Carlo Masters, but he won it anyway. The ATP computer won’t show it, but the week in the Principality ended with a clear message, there’s blood in the water, or on the dirt, if you will. 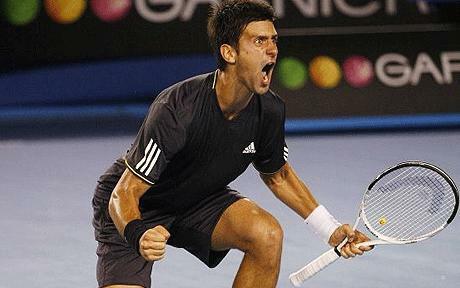 The only question left: Is Djokovic ready to feed? For the last six years, what’s gone on is an unprecedented streak of brilliance from World No. 1 Rafael Nadal that’s led to five triumphs at Roland Garros, his only loss in that span being a four set revolt in 2009 when he lost to his own tendonitis-plagued knees. Monte Carlo, though no longer mandatory according to the ATP, has proven a harbinger of the dominance to come on the terre battue. Six consecutive years, Nadal has come and seen off all challengers, thrice turning back the arguable “Greatest of All-Time” Federer at the final stage and last year all but humiliating his compatriot Fernando Verdasco 6-0, 6-1. This year the story is a bit different. Federer is now 3rd in the rankings and losing ground. Instead of the preordained final tilt with Nadal, Federer fell meekly to Jurgen Melzer, a player whose lunch Federer used to eat with nary a thought. It was Federer’s first career loss to Melzer, a solid Austrian who shook off the journeyman tag with a career defining run to the top 10 over the past year or so. How does a player stay at the top of the rankings? Very simply, they beat the players they’re supposed to beat. Frankly, it’s Andy Roddick’s specialty. Melzer falls directly into this category. These are the matches Federer needs to win to stay in shouting distance of the top two. In short, he’s not winning them anymore. Federer’s 285 weeks at No. 1 ended on last year’s clay court swing. His time of contending for the post may have ended at the beginning of this year’s. 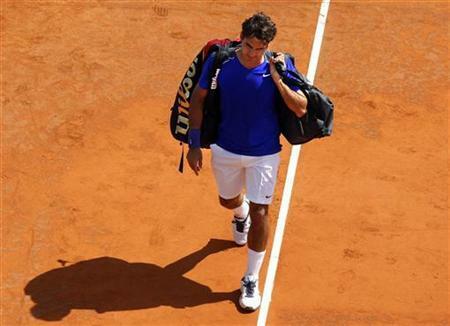 Federer has often spoke of his love of the game keeping him on tour even once Nadal had dethroned him at the top. Now though, it’s not just the polite young man who had served as the Mighty Fed’s apprentice encroaching on his territory, it’s the rank and file of the second tier. Winning as many matches over a protracted period as Federer has builds deep reserves of confidence, but one suspects given his recent form that they are beginning to run dry. Confidence’s brother-in-arms is pride, and pride is far harder to lose. When you spend literally half of your career as the consensus favorite in virtually every match you play, how long can you keep your chin up suffering the indignity of having the weekends free for shopping? That said, Nadal isn’t exactly exalting in Federer’s decline. The Spaniard at his best plays a brutal game of chess disguised as tennis. Although the knees aren’t taped that doesn’t mean the way Nadal plays isn’t taking its toll. For as much as has been written about the Spaniard’s physicality, his greatest strength has always been mental. Like Sharapova with a better forehand, but the same pre-serve hair tuck ritual, Nadal is icily cool, calculating, precise with his Babolat in hand. The inability to capture the Australian Open, the Rafa Slam and a measure of one upsmanship over his career rival and buddy Federer seems to have exacted a toll. Much like with Federer though it’s primarily mental and driven by the same question. What are they playing for? When you’ve won it all, the only thing left is to lose. Despite being at different points in their careers from an age perspective, Federer and Nadal’s resumes are equally gilded; their trophy cases gleam with all of the most spectacular hardware on offer; their bank accounts provide them a fair measure of financial security. What’s there left to hunger after? Both men need to ask themselves that question, especially the Spaniard. 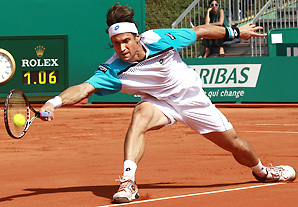 Nadal played compatriot David Ferrer in the Monte Carlo final, a physical specimen himself and a dogged competitor. Ferrer is not a man who gives away matches. He may be beaten, but he rarely beats himself. Nadal put on a tentative display, defending from behind the baseline, waiting for errors on rally balls and trying to take the legs of a man built like the shortest California redwood in history. The explosive precision to which we’re accustomed was largely left inside his racquet bag today and frankly all week. Nadal played not to lose, which is not often enough against a man, like Djokovic, who will go all out out to win. Novak Djokovic sat out this week, but he appeared in the principality to practice, ostensibly to ensure he was abiding by the residency rules of the tax haven and as a specter of things yet to come. Ultimately, Nadal inherited the King of Clay honorific from Borg and Vilas, not his more immediate dirt dog predecessors like Ferrero or Kuerten and as such it will not be surrendered over the course of an event or a season. The throne however has begun to wobble. Oh yes, Nadal won the match 6-4, 7-5 over Ferrer, he won his 7th Monte Carlo title, 19th Masters title and 44th ATP crown overall today, but you can’t help feeling it was a turning point. Watching this match, you have to assume Novak Djokovic is smelling blood. Whether Nadal and/or Federer can fend off the coming attack is the question. By the time we leave Paris, we will have our answer. Their collections of these branded watches are super cool and each watch has its exclusive choice of pattern which will compliment every occasion. Their watches have casual and formal approach too. You can wear these watches in promotions, meetings or even rolex replica sale too on jackets and denims. It comments men of all age brackets and varied individuality. Watches are beautiful accessory and perfect for men of all kinds. They can refute arm connectors but men cannot say no to watches. Nor perform these people drop within the fake hublot of reconditioned products. This kind of dior replica have a press associated with authenticity showing unique serial amounts in the producer. While you tend to be purchasing wrist watches via a good web store, these people still stay the actual images of the particular producers. Watches are timeless accessory for men and they rolex replica sale wearing it too. Watches make men look mature and fine if they compliment the attire. The watches for men in The indian subcontinent mostly come from reliable brands like rolex replica sale track.